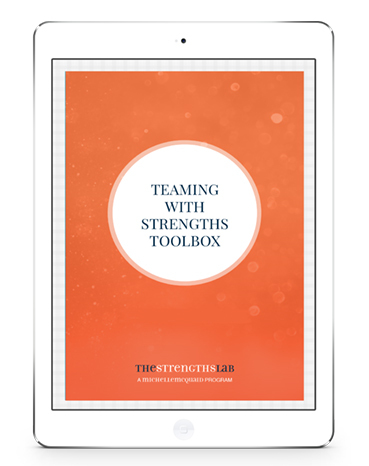 Want to help your teams to fuse their strengths? Can your team members easily name each other’s strengths? When you work together, do you help each other to find ways to do more of what you do best? When you give each other feedback, is it strengths-focused? When you struggle with each other, do you understand where your strengths may be colliding? If you’re struggling to answer “Heck yes!” to each of these questions, then learning how to team with strengths would help your group members. Up to six times more engaged in their jobs. Up to 38% more productive. More likely to have happier customers. Make others feel psychologically safe and valued by being able to spot their strengths – those moments when people really light up. Understand how your team works at its best and where they might struggle by mapping people’s strengths and aligning these to the goals you are trying to complete together. Fuel people’s feelings of confidence and commitment by giving each other on-the-spot strengths-based feedback to help each other do more of what you each do best. A short training video detailing how teams can map their strengths, better align their strengths to the team’s tasks and give each other strengths-based feedback. An introduction guide with the business case for teams being more strengths-focused, and the practical steps teams can take to bring out the best in each other. Done-for-you templates and playsheets you can download, print, and steal with pride to help your spot people’s strengths, know when people are at their best, map your team’s strengths, build a wall of stars, nominate secret strength spotters, have kind strength-feedback conversations, hold weekly strength check-ins, create a strengths tasker for your team, and set up strength collision conversations.